Teams don't bring their coach buses to the Australian WorldTour race, so each squad is given two cars and a van to use. GLENGL, Australia (VN) — Dimension Data’s Michael Valgren was working on his tan. Elia Viviani hid out under a bed sheet strung between van doors at Deceuninck-Quick-Step. Bora-Hansgrohe’s Peter Sagan had no place to hide and was patiently signing autographs and posing for photos nonstop. What did they have in common? No team buses. Welcome to the Santos Tour Down Under, one of the season’s few WorldTour races that offers a throwback to the days when riders were not hidden inside team buses. The six-day season-opener in far-away Australia means that teams cannot ship their luxurious team buses halfway around the globe. Instead, organizers fit each team out with a large passenger van and two race cars. Riders are shuttled back and forth to each stage in the vans and cars. It’s old-school in its purest sense. Instead of being hidden behind tinted windows, riders often sit on the curb in the shade or lounge on chairs. 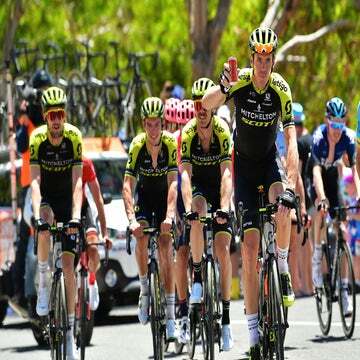 The Tour Down Under and a handful of other races throughout the calendar are like Throwback Thursday in the peloton. One complaint among old-timers is how the advent of the team bus has put up a permanent barrier between the fans and cycling’s stars. Back in the day, riders would arrive an hour before the start and sit on curbsides or find a café to wait for the race to begin. Team buses and campers started to make appearances decades ago and many teams embraced them in the 1980s. The Dutch team PDM was among the first teams to have a dedicated team bus. By the 1990s, nearly every major team had one. Today, a fleet of state-of-the-art touring buses accompanies the top teams. The best buses are kitted out in custom-made seats for each individual rider and fully interactive video screens to dissect each day’s race. The upsides are plenty, especially for riders. They can shower and change in private, as well as begin their recovery right after a stage by putting up their feet and getting rehydrated and fed after a hard day of racing in a spacious, climate-controlled vehicle. Some buses are even outfitted with showers, kitchens, washing machines, and full-sized beds. Traditionalists say team buses have put a chill on cycling’s ambiance and imposed a wall between fans and the riders. Journalists often grumble that riders stay hidden inside team buses too long, and only come out at the last possible moment to sign in and head straight to the race start. Riders couldn’t imagine racing an entire calendar without team buses, but for a week in sunny Australia, most didn’t seem to mind. One of the unique features of the Tour Down Under is the fact that the entire race entourage stays in one central hotel for the race. 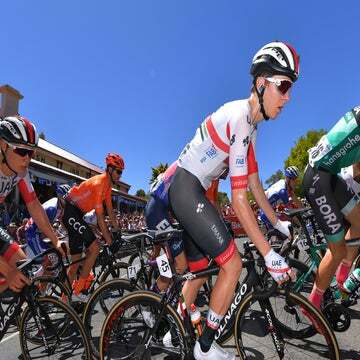 All of the stages are spread over the Adelaide region, with the starts and finishes never more than one hour away by vehicle. The spoke-and-hub concept means that the ride in the van is roughly an hour following stages that generally run about four hours. That equals a relatively easy day in the saddle and car. That’s in contrast to Europe’s grand tours, when races can last up to six hours. There is often a one- or two-hour ride back to the team hotel. Australian fans certainly can get closer to the riders than their counterparts in Europe. Even though the van and team area is fenced off by barriers each morning, the fans can get right up next to where the riders are preparing for each stage. And once back in Adelaide, riders stroll across a central plaza from the day’s main staging area and hub to the team hotel. Fans waiting around each day have plenty of chances to ask for an autograph or a quick photo.